So – we’ve left Jonah running away from God’s presence and call. Doing the exact same thing those nasty Ninevites were doing. Rebelling. Of course, running away was futile. God is everywhere, but just like a pouting child, who runs to the next room to ‘get away’ from his parent’s commands he didn’t like, Jonah tries to distance himself from the unpleasantness. When a storm shakes the boat in which Jonah is fleeing, Jonah confesses that he’s running away from God and these sailors are aware of the awesomeness of God – even though they are pagans. They even asked God’s forgiveness for throwing Jonah overboard. As soon as was thrown into the sea, the storm stopped. And “the Lord appointed a great fish to swallow up Jonah.” Did you get that? The Lord appointed. That fish was God-designed. He is ruler of nature – and this ‘great fish’ had a purpose. An ‘agent of rescue’ so to speak. God’s messenger to get Jonah back on the right track. And that’s just like God. Rescuing his kids, because He knows we can’t save ourselves. He knows that our running away from His will is only going to lead us into a big storm. Mind you, God doesn’t usually use whales to get his point across, but…it worked. The most beautiful thing about this is: Storms come – but God is still God of the storm and the fish. He sent the storm AND the fish. Both planned because He loved Jonah THAT much. 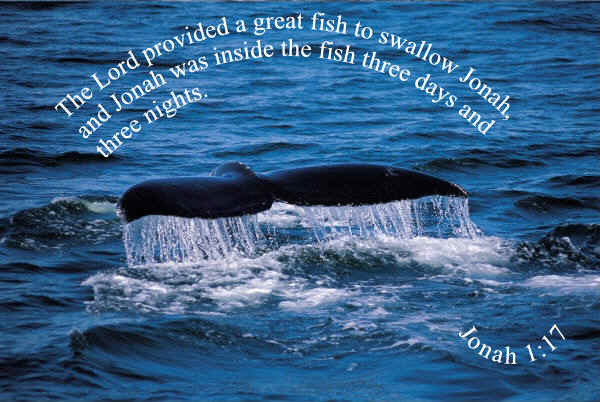 He cared about the attitude and health of Jonah’s heart so much, he moved nature to get Jonah’s attention. It’s almost like God gave him a ‘hint’ at what true separation would be like and, at this point, Jonah got the hint. Also, even in Jonah’s rebellion, God did not forget him. He shook him into reality of His calling. God saves his people. Tomorrow get ready for the last installment of Lessons From the Belly of the Whale as we discuss the Not-So-Happy-Happy-Ending of Jonah’s story. What lesson did the Ninevites learn that Jonah didn’t?